This old post card features an arial veiw of the Frederick J. Munkholm proprieties on U.S. Hy. 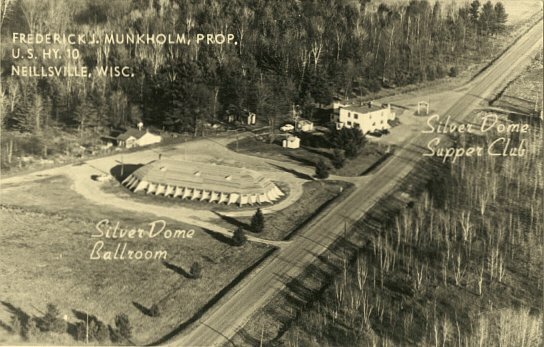 10 in Neillsville, Wis.
Hello, my name is Brooke Miller and I am researching the Silver Dome Ballroom for a Wisconsin History project. I am a senior at Neillsville High School and I live on Sterling Avenue, just past the Silver Dome. One quick question that I have is when was this photo of the dome taken? I thought that this would be a great choice in the fact that my information can be obtained without myself putting forth a lot of time traveling to receive it. If you have any interesting information that could be useful to me and my project, I would really appreciate it. Thank you very much. Thanks, Virginia, for this photo. Lynn & Ruth (Roder) Feutz had their wedding dance & reception at the Silver Dome in September, 1936. I wish they'd lived to see this web site with so many of their wonderful memories recorded.